Come take the journey with Kay as she shows you how to begin adding soldering, dapping, sawing, and other skills from the metalsmith’s repertoire into your beading. Kay’s projects will also show beginner metalworkers how to incorporate the rich, colorful, sumptuous look that semiprecious beads bring to metal jewelry. These necklaces, earrings, bracelets, and pendants present such a complete range of techniques, all fully and beautifully illustrated with step-by-step photos. You’ll be amazed at the eye candy you can create! 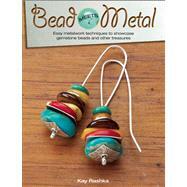 Kay Rashka has been creating jewelry for 25 years, working primarily in sterling silver and semiprecious gemstones. She teaches in and around her home studio near Madison, WI, at venues including the Bead&Button Show, Peninsula Art School, the Art Glass and Bead Show, and Shake Rag Alley.